Washington 19-year-old rookie Juan Soto become the youngest player to steal three bases in a game, had an RBI single and scored the tiebreaking run, helping the Nationals stop the Atlanta Braves' season-best, six-game winning streak with a 7-1 victory on Saturday. ATLANTA (AP) — Juan Soto shrugged off his latest accomplishment after showing what he can do on the bases. 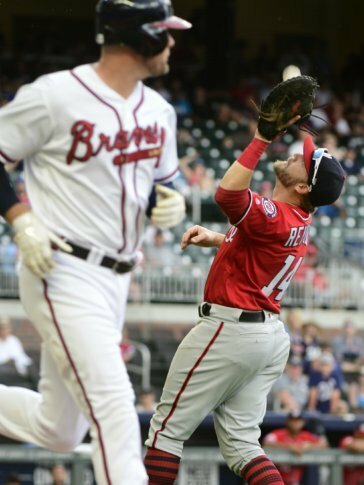 Soto become the youngest player to steal three bases in a game, had an RBI single and scored the tiebreaking run, helping the Nationals stop the Atlanta Braves’ season-best, six-game winning streak with a 7-1 victory on Saturday. Soto hit an RBI single in the first inning and stole second, then walked in the fourth, stole two bases and came home on a bases-loaded walk for a 2-1 lead. He surpassed the mark set by Oakland’s Rickey Henderson at 20 years, 241 days on Aug. 23, 1979, against Cleveland, according to the Elias Sports Bureau. Soto began the day with two stolen bases, but his video study showed he could run on Braves starter Julio Teheran. Soto also extended his on-base streak to 20 consecutive games to join Hall of Famers Mel Ott and Mickey Mantle as the only teenagers to do so. Nationals starter Jeremy Hellickson may miss the rest of the season after reinjuring his right wrist while batting in the fourth inning. Hellickson sprained his right wrist on Aug. 15 when he landed awkwardly while covering home plate after throwing a wild pitch at St. Louis. He made his first appearance since and got hurt again. The 2011 AL Rookie of the Year is scheduled for an MRI on Sunday. Hellickson, who is 5-3 with a 3.45 ERA in 19 starts, missed 22 games in June because of a right hamstring strain. He grimaced after fouling off the first pitch of his at-bat in the fourth against Teheran (9-8), then swung and missed at a low and outside pitch. Hellickson walked to the dugout and was examined by director of athletic training Paul Lessard. Andrew Stevenson pinch hit, took two balls and swung and missed at strike three. The strikeout was charged to Hellickson, who allowed two hits and one unearned run in three innings. Jefry Rodriguez (3-2) relieved to start the bottom half and pitched 4 2/3 hitless innings. He also drove in his first big league run. Atlanta’s lead was cut to 6½ games over second-place Philadelphia in the NL East. Teheran gave up two runs, three hits and a career-high six walks in four innings. Twenty-year-old Ronald Acuna Jr., major leagues’ slugging percentage leader since the All-Star break, singled in the first, took third on Hellickson’s two-base throwing error and a run scored on Freddie Freeman’s sacrifice fly. Washington opened a 5-1 lead in the sixth when Adam Eaton hit a run-scoring double and Anthony Rendon had a two-run double off Touki Toussaint, who walked four in the inning — one intentionally. Atlanta pitchers walked 14, increasing the team’s two-game total to 20. Rendon has reached safely in a career-best 24 straight games. … Soto, the first player in franchise history with three walks and three stolen bases in a single game, has hit safely in nine straight and has a .351 average with two doubles, four homers, nine RBIs, three walks and nine runs over that span. … Soto ended a streak of four straight games with a homer. His solo shot Friday made him the third teenager to hit at least 20 homers in a season, two behind teammate Bryce Harper in 2012 and four behind Tony Conigliaro in 1964. Nationals: Harper fell hard on his left wrist with an unsuccessful dive attempt on a liner by Kurt Suzuki that fell in right-center for a single leading off the second. Harper walked three times and struck out twice. Braves: 3B Johan Camargo missed his third straight game because of left groin tightness. Nationals RHP Tanner Roark (8-15, 4.37 ERA) starts Sunday against Braves LHP Sean Newcomb (12-8, 3.82 ERA). Roark allowed 11 runs and 20 hits in 9 2/3 innings in two starts last month.